Featuring over works from 250 leading and emerging artists from around the world, ART PAPERS Art Auction invites you to build your art collection while enjoying a great party! 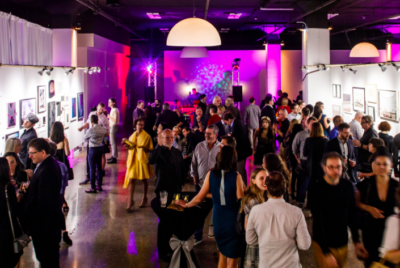 This year, the 20th annual Art Auction offers both experienced and novice art lovers the opportunity to build their collections while enjoying a great party! All proceeds benefit the award-winning programs of ART PAPERS, an Atlanta-based nonprofit organization covering contemporary art and culture in the world today. VIP guests will enjoy early access with the ability to purchase pieces prior to public opening, meet the exhibiting artists, learn about the works firsthand! A VIP lounge with open bars and complimentary hors d’oeuvres will also be available. Rare Form Crew’s DJ Timothy DeGroot sets the party vibe among a fully stocked bar, 250 artists, and food from the city’s favorite restaurants. More information on the 20th annual ART PAPERS Art Auction. « It’s “A Grand Affair” at Huff Harrington Fine Art!